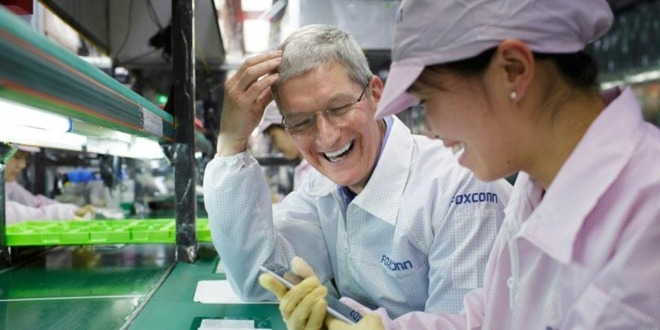 Apple CEO Tim Cook on a visit to a Foxconn factory. "Efforts are in progress to recruit for more than 50,000 positions across our China campuses in Q1 2019," Foxconn told Reuters in response to questions about whether it was currently hiring. On Friday a report said that about 50,000 seasonal workers had been dismissed since October, when the manufacturer would normally keep people on until at least January. Though not confirmed it's strongly believed that the cause was poor iPhone sales, particularly in China, which Apple recently blamed for a $5 billion revenue shortfall last quarter. In December, five production crew members told Reuters that at Foxconn's Zhengzhou factory, thousands of people -- including some permanent employees -- had left voluntarily because of a lack of weekend and overtime opportunities, and cut or canceled bonuses. Apple generates about half of Foxconn's annual revenue, so any serious dip in iPhone sales has automatic repercussions. Chinese iPhone sales were likely hurt by a combination of factors. The country's economy is in rough shape, only exacerbated by a trade war with the U.S. Into this Apple launched its most expensive iPhones ever, despite local brands like Huawei and Xiaomi offering quality phones for hundreds of dollars less. Foxconn may be working to shift some of its iPhone production to India, joining fellow Apple partner Wistron. That could mitigate the impact of trade wars while allowing Apple to meet local sourcing requirements for retail, as well as dodge import costs, which have pushed iPhones further out of reach for most Indians. The iPhone controls just 1 percent of the Indian smartphone market. "The statement is most notable for what it doesn’t say. Foxconn doesn’t deny the earlier reported layoffs (from its iPhone factory at Zhengzhou), and doesn’t say which of the facilities will get the new hires. Different customers will have different peaks and troughs in production, and there is no reason to believe it would be hiring for iPhone production at this point, so those workers are likely destined for production of non-Apple products." They will all be used to assemble Hauwei phones instead of iDevices. If people are laid off it's Apples fault only. To me this seems like the Chinese government putting pressure on them to rehire the ones laid off because of the weaker iPhone sales (that were weaker because of China trying to "get" Trump for his tariff negotiations).